Historically, the season of oysters has been during months with the letter “R.” The legend goes way back to days of no refrigeration and the traditional oyster season that began on October 15. Fortunately, for our eating pleasure, oysters are available year round by way of both wild and cultivated oysters and the fact that we have refrigeration and safe growing, harvesting, and handling practices. While we do have to be mindful of the Vibrio bacteria especially if eating raw oysters from warm waters, a large percentage of cultivated oysters are sterile. Oysters steamed, baked or otherwise heated through kills the dangerous bacteria. 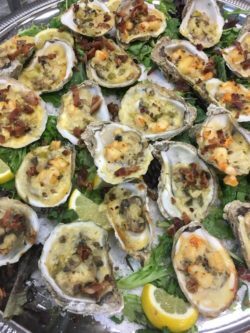 Enjoy this Oyster Bienville recipe no matter the time of year or origination of harvested oysters. This baked oyster dish topped with creamy shrimp sauce is named in honor of Jean-Baptiste Le Moyne de Bienville, who was a French Governor of Louisiana and founder of New Orleans in 1718. Spread a 1/2 inch thick layer of rock salt on a large baking sheet and across the bottoms of 2 large plates. Set aside. Fry the bacon until just crisp in a medium skillet over medium-high heat. Add the onions, salt, and cayenne and cook, stirring for 2 minutes. Add the garlic and butter, and cook, stirring, for 2 minutes or until the butter melts. Add the flour, and stirring slowly and constantly, cook for 2 minutes. Add the milk and wine and stir to blend. Reduce the heat to medium, then add the mushrooms and shrimp. Stir and fold to mix and cook until the mixture is thick, 3 to 4 minutes. Add the Parmesan, lemon juice, green onions, and parsley and stir to blend. Remove from the heat, add the egg yolk, and blend well. Let cool to room temperature. Arrange the reserved oyster shells on the prepared baking sheet. Put 1 oyster in each shell and top with about 1 1/2 tablespoon of the sauce, spreading the sauce evenly out to the edges of the shell to completely cover the oyster. (Alternatively, pipe the sauce over the oysters.) Bake until the sauce is lightly browned and the oysters begin to curl around the edges, about 20 minutes. Using tongs or a spatula, carefully transfer the hot shells to the salt-covered plates and serve immediately. 5 Totally Unique Wedding Ideas for the Most Memorable Day EVER!